If you've been a Christian for very long, you've probably heard the warning not to pray for patience. Because God might give you a lesson in patience. But I'd argue that God has provided us with patience beyond compare, we only have to be willing to step aside and let His Spirit's patience live through us. 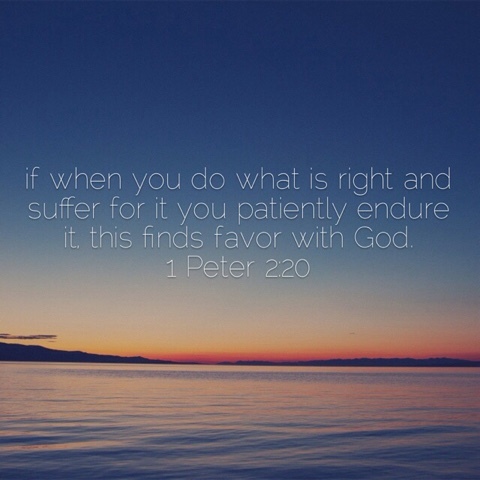 This week's fruit of the Spirit is the ever popular patience. We don't want to be patient. Not when it comes to something we want. And sometimes God doesn't ask us to be! I prayed that I'd like to get to know this guy I had met one better. The next morning Tim Schreiner asked me if I'd like to go to coffee. Sometimes we have to be patient just by the very nature of what we are asking. I pray for the boys and men who will eventually be part of the girls' lives. Obviously their weddings are not even in the works right now. I'm happy to be patient about that one! But when a loved one is sick, we want them well sooner rather than later. How do we know God will grant us supernatural patience? Beyond Galations telling us it is a fruit we will bear when we allow His Spirit to live through us, we are children of an unfathomably patient God. Sometimes we ask "things are getting worse every day in this world, why doesn't He just end it?" Sweet friend, He is still winning souls to Him. Frankly my dear, get to work! Our time is short and we have a knowledge of the Holy that we need to share. Instead of waning and whining "When will He rescue me from this world?" we can ask "Who can I help You rescue? How do you want to use me?" In session four of her Daniel study, Beth Moore states that "His [God's] patience doesn't run out, but He does set limits." 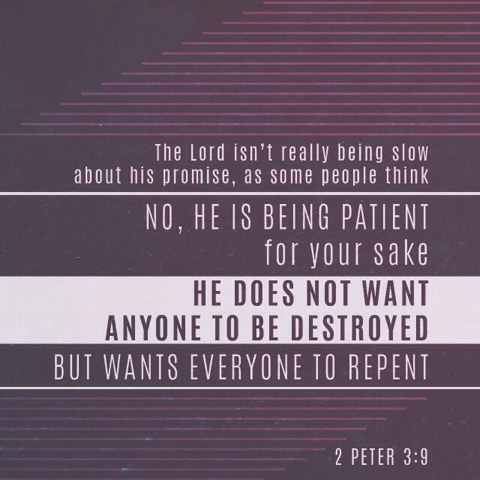 Instead of being impatient with Him would should check to be sure we aren't testing His limits. Abraham received a seemingly impossible promise from the Lord. This old man would be the patriarch of a nation which would eventually outnumber the stars. Once again, bearing the fruit of the Spirit involves trusting Him. 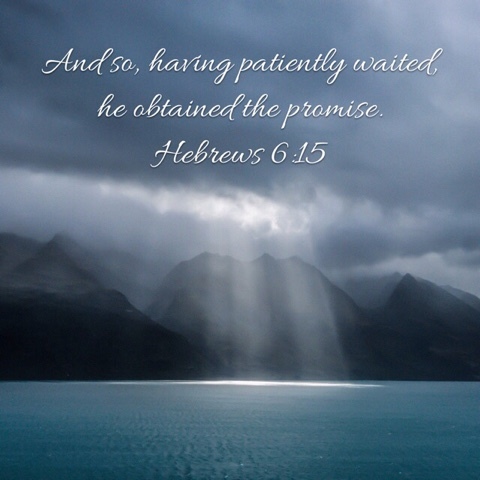 When we trust that God keeps His promises and His timing is perfect ... it becomes a lot easier to wait on the Lord. We also curry favor with Him when we are patient. Believe that He sees what you are going through. You are storing up treasure in heaven when you (without sin) are suffering. Take comfort that He sees and He is crediting you with righteousness. Don't grow weary of doing His will. Draw strength from knowing He isn't ignoring your suffering. Our patience is also for others. Even the unruly, the faint hearted, the weak ... the sinner. 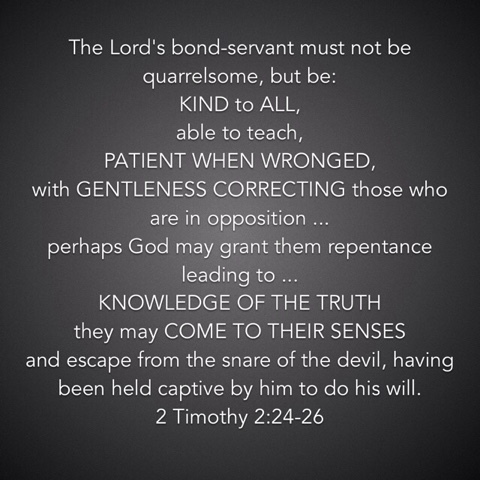 The Bible doesn't say be patient with others but lash out at others. Even when the world is doing us wrong, we should be patient. So often the Lord refers to us as children and sheep. If you have been around either ... you know that they just don't know. They need to be led, even sometimes prodded, encouraged, helped along. Being patient with someone may be the very thing that wins them over and frees them from the oppression of Satan and his demons. Angrily shouting religious superiority over someone who disagrees with us is not the answer. Kindly serving, patiently, steadfastly sharing the truth, being consistent ... gently disagreeing ... stand tall in God's light ... not stand up ready to fight. To the world our patience may sometimes look foolish. Don't worry about what other's think (I know, easier said than done). Sometimes being patient may mean taking a deep breath in through the nose and out through the mouth with a whispered prayer. 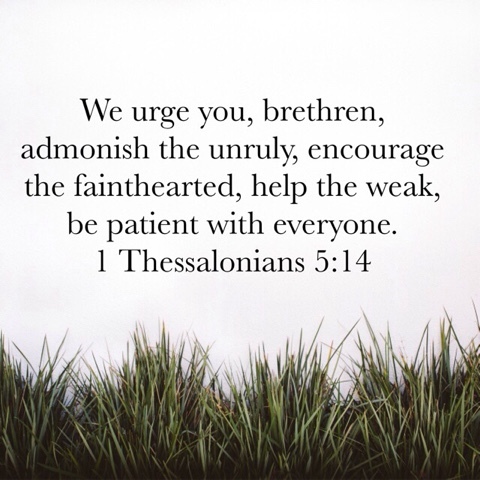 But a wellspring of unending patience is there for us to once again pour out on others. God is not going to run out of patience to give us so don't be afraid to give it away.